Those of us in the Anarchist Black Cross, have been burdened by the fact that most of the history of this aid organization has been lost in the pages of time. Many of us have worked diligently in the rediscovery of our past and recently information has finally emerged, giving us just a small glimpse into the rich history of the Anarchist Black Cross movement. In just the last few years, we have learned about the Lettish section of the Anarchist Red Cross, a section of the movement, which very little has been written about. At first glance this section of the organization¹s history seems rather uneventful, but with closer examination we have discovered one of the interesting chapters in U.S. anarchist history. The events that I speak of are the attempted assassination of John D. Rockefeller and, what later became known as, the Lexington Avenue Bombing. The Anarchist Red Cross emerged after the 1905 Revolution with the increase of imprisoned anarchists in Russia. Due to other prisoner aid groups refusal to support anarchist political prisoners, Russian anarchists on the streets and those in exile created the organization to support their comrades held in Russian prisons. Within a few years, the organization spread beyond the Russian borders to areas, like the United States and England, where exiled revolutionaries had settled. By 1913, the organization began to see ethnic sections of the organization develop, focusing on those revolutionaries imprisoned by the Czar from their own regions. One such example was the Lettish Anarchist Red Cross specifically organized to assist imprisoned Anarchists in Latvia. The organization was formed by individuals who had participated in the revolutionary movement in Latvia. They fled from their homeland and arrived in America, still holding on to the revolutionary ideals. Found within the Latvian anarchist community, were three individuals: Charles Berg, Carl Hanson, and Louise Berger. All three were born in Latvia. Charles Berg was born in 1891 in the city of Angern found in the province of Kurland. His father was a wealthy ship owner and was able to give his son a decent education. While he was in school, however, a strike broke out among the students; Charles, one of the most active militants, found himself expelled for his involvement in the strike. In the 1905 revolution, at the age fourteen, Charles Berg joined the ranks of the revolutionists and became active in revolutionary propaganda, using religious services to spread this ³new religion.² Later that year, he became a member of the Forest Brethren, a guerrilla group active in the Baltic. After the group broke up, he assisted in transporting arms across the Russian border, until he was forced to go to Hamburg. Carl Hanson¹s childhood was very similar to that of Berg¹s. At the age of nine, he had already been involved in organizing fellow students against the teacher¹s lesson plans. By the age of fifteen he began working at a machine shop and was also fired for his involvement in a strike. His next job at a silk mill met the same fate. The two men met while working as merchant sailors in Hamburg. After spending some time working together and becoming close friends, the two men, along with Hanson¹s stepsister, Louise Berger, headed toward New York in 1911. Sadly, little is known about Berger¹s life prior to coming the United States. When the three arrived in New York, the three Anarchists joined the Lettish Anarchist Group, a group involved in the publication of anarchist literature. However, when a number of comrades organized a Lettish Anarchist Red Cross in December of 1913, the three became some of its first members. 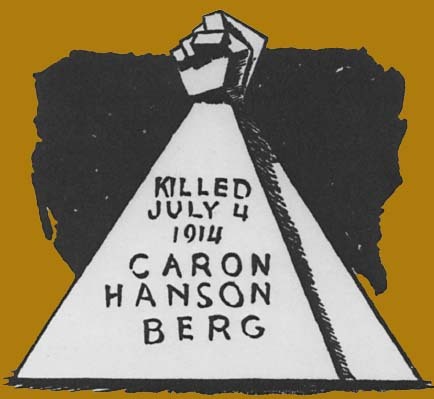 During this same period, Berg, Berger, and Hanson also became active in the movement for the unemployed and the Anti-Military League. Most of these movements used Ferrer Center at their hub for activities. Here individuals like Alexander Berkman, Emma Goldman, Luigi Galleani, as well as many individuals from the Anarchist Red Cross, spent a great deal of their time. It was also were plans to assassinate John D. Rockefeller would soon be hatched. On April 20, 1914, on the orders of John D. Rockefeller, National Guardsmen entered the tent cities of striking miners in Ludlow Colorado. The Guardsmen attacked the miners and their kin, then set fire to their tents with oil and kerosene. The attacks left eleven children and two women died. Following this, three individuals, including a strike leader, were beaten and killed. The incident, which became known as the Ludlow massacre, set off a series of protests across the nation. These demonstrations directed their anger at John D. Rockefeller Jr. for being the one responsible for calling out the Guardsmen. Organizers of held their demonstrations at the front gate of Rockefeller¹s mansion in Tarrytown, New York. Police came in and arrested several individuals including Charles Berg and future co-conspirator Arthur Caron. This suppression of the protests sparked a larger battle over free speech that was to take place in the courts and the streets. The Colorado massacre and the Tarrytown battle enraged most radicals and plots began to emerge within the revolutionary communities to seek revenge against Rockefeller for the crimes committed under his control. Members of the Lettish Anarchist Red Cross, including Berg, Hanson, Berger, and members of the Bresci group, an Anarchist group influenced by Italian Anarchist Galleani, began to sketch out a plan to attack Rockefeller. Berg, Hanson, and I.W.W. member Arthur Caron began to collect dynamite from Russia, and according to some accounts, stored it in Louise Berger’s apartment. Meetings were held at the Ferrer Center, where the plotters devised a plan in which Caron, Berg, and Hanson were to plant a bomb at Rockefeller’s home in Tarrytown. The plot was scheduled for July 3rd, but for reasons unknown, the plan was called off at the last moment. The three men returned to Berger’s apartment from Tarrytown, with the bomb in hand. According to eyewitnesses, the three men along with Alexander Berkman met once more that night at the Ferrer Center. According to others involved in the plot, Berkman was the chief conspirator and the only person who had the experience in such an act. Because of his probation for a previous case, Berkman chose to remain behind the scenes rather than on the front line. Despite claims by others, Berkman denied any involvement or knowledge of the plan. The meeting with Berkman went late into the night with the men deciding to make a second attempt at Rockefeller the next morning. The story of the fateful day is as follows: At 9 a.m., July 4th, Louise Berger left her apartment and headed over to the office of the Anarchist paper known as Mother Earth on 119th Street. It is assumed she was probably heading there to inform Alexander Berkman that the bomb had been readjusted and was ready. At 9:15 an explosion occurred from the sixth story of a tenement at 1626 Lexington Avenue. Passers-by witnessed a shower of debris and rubble fall into the street. 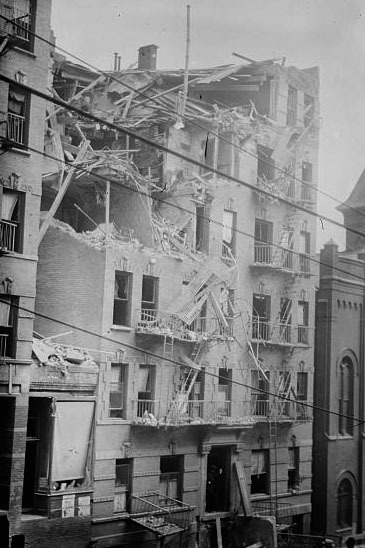 The three upper floors of the tenement building were wrecked from the explosion, while debris showered rooftops and the streets below. Large pieces of furniture were thrown hundreds of feet in the air due to the power of the blast. The bomb intended for Rockefeller exploded prematurely killing Carl Hanson, Charles Berg and Arthur Caron. A fourth person, Marie Chavez, who had not been involved in the conspiracy but merely rented a room in the apartment, was also killed. The blast threw Caron’s body onto the mangled and twisted fire escape. The mutilated bodies of Marie Chavez and Hanson were found inside of the apartment. The blast had torn the body of Charles Berg into pieces, which were seen by spectators being thrown through the air onto the streets. In total, twenty other people were injured, seven of them severely enough to be hospitalized. Another man, a Wobbly named Mike Murphy, was spending the night in the apartment, when the explosion occurred. The blast destroyed the floor underneath him, causing his bed to fall into the apartment below. Slightly dazed and confused, Murphy was able to walk away from the incident with only the loss of some clothes and a few minor bruises. During the chaos after the bombing, Murphy was able to slip away to the Mother Earth headquarters, where Berkman quickly sent him away accompanied by Charles Plunkett, another co-conspirator of the bombing. Murphy was first taken to New Jersey and then to Philadelphia by members of the Radical Library and finally on to Canada. On the day of the accident, a member of the Bresci group, Frank Mandese, was arrested in close proximity to Rockefeller’s home in Tarrytown. With a lack of evidence, the police were forced to release Mandese. Though soon afterwards, the police raided the Bresci group and roughed up its members, whom they suspected were involved in the bomb plot against Rockefeller, but had little proof. The incident caused immediate repercussions against the Ferrer Center, which was only a few blocks away form the explosion. Police agents infiltrated the adult classes in order to detect any of the co-conspirators of the three dead men. The center acquired the reputation of a bomb factory and a hotbed for subversion. Support for the center dwindled to such an extent the collective was later forced to move outside New York City and began again in Stelton. Despite the increased repressions, the majority of the Anarchist community remained loyal to their comrades, hailing them as heroes. Poems written by Mike Gold and Adolf Wolff were laminated in Di Shtime fun di rusishe gefangene the newspaper of the Russian section of the Anarchist Red Cross. Alexander Berkman was able to obtain the bodies of his dead comrades for cremation and funeral demonstration at Union Square but the authorities refused to allow a public funeral to take place for the Anarchists. Regardless, their friends were insistent that a funeral of their beloved comrades would take place. And on that day over twenty thousand supporters gathered in Union Square to mourn for Berg, Hanson, and Caron. The police refused to allow the funeral to continue, but instead of attempting to remove the crowd from Union Square, detectives arrived at Berkman’s house in an attempt to seize the urn that contained the remains of Caron, Berg, and Hanson. One step ahead of the police, Berkman was able to slip out the back door where he had a red automobile waiting for him, just in case. He sped towards the demonstration in hopes of being able to make it to the speaking podium before being caught. As he approached the crowd, the police mistook Berkman’s car to be that of the Fire Chief and eagerly cleared a lane for the car all the way up to the platform. By the time the police realized what had transpired, Berkman was already up on the platform. Any attempt to seize the urn at this point would have caused a riot. Thousands of mourners passed through the office to pay their last respects. After the funeral, the urn of the fallen comrades was taken from the Mother Earth offices to the Ferrer Center where it remained there until the school closed several years later. It was then taken to the Stelton Colony where the ashes were released in the wind. Afterwards, the bronze fist and hollow pyramid of the urn was used by the Stelton Colony as a bell to call children and adults to meetings. As for Louise Berger, she remained active in the United States for several years. At some point, probably after the 1917 Revolution, She traveled back to Russia to assist in the revolution. All that is known about her activities there was that she joined up with armed robbers in carrying out ³bank expropriations.² She fell ill and died during the typhus epidemic that swept threw Russia 1920-1921. Up to this point, these two comrades, Berg and Hanson, have never been given their proper place in the history of the Anarchist Black Cross. Many Anarchists have met the same fate. Too many have actually lost their lives directly because of their involvement in this organization and it is only through the rediscovery of this organization¹s past can we place them in pages of history once again.